Staying well, fit and active as you age can present some major challenges. Balance difficulties. Problems walking. Dizziness. Muscle weakness. Joint stiffness. Poor flexibility and more. 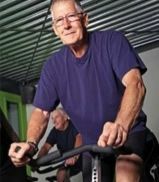 Many older patients are motivated to continue on the path to health and wellness after therapy. For those patients, we offer fitness training, wellness programs and Pilates instruction. Our physical therapy and strength/conditioning programs, including aquatic physical therapy, will help you maintain your health, avoid injury and live an active, fulfilling life. We'll also help you achieve your personal goals safely and with the best possible results. Wellness is the opposite of illness. Your journey toward wellness begins when our doctor of physical therapy looks at the factors that might keep you from being well. We evaluate your individual abilities, limitations and lifestyle and develop a plan to help you get past illness or impairment. Then we focus on helping you stay well. We teach you to protect yourself against problems that can limit your quality of life. Physical fitness is essential to wellness. That's why your customized wellness program will include a fitness plan to help you increase strength, muscle tone, stamina and flexibility. Pilates is an exercise program that emphasizes strengthening the core muscles of the abdomen and back using apparatus and mat training. We customize sessions based on your own individual needs and goals. Your sessions begin with an individual assessment followed by private, semiprivate or group classes. The program is ideal for a wide range of ages and abilities - people who are looking for a great workout to enhance overall health and wellness. For more information on our compassionate treatment for geriatric conditions or to schedule an appointment, call the Pequa Physical & Aquatic Therapy center nearest you today. We welcome and encourage your referrals.